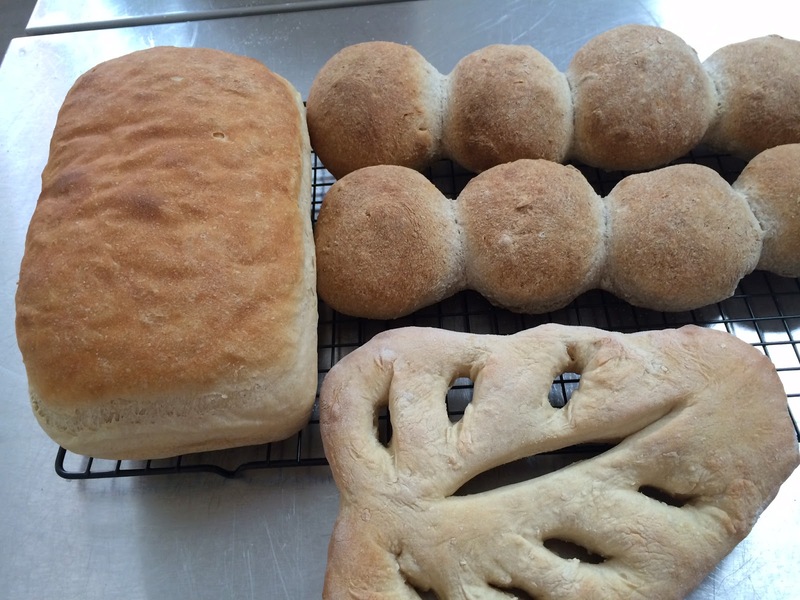 Bread Making at Conibear's Kitchen - My End Result! A bread making course run by Angela of Conibears Kitchen was the start of my middle-aged foray into making bread from scratch. Ange immediately put us at ease with introductions and chat over coffee and her homemade beetroot and chocolate muffins. This may sound a weird flavour combo, to those uninitiated to veggies in cake, but the taste was deliciously moist and chocolatie. 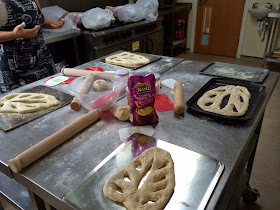 Then we got stuck straight into the business of bread making. I’ve made dough before (mainly for pizza bases, I have to confess) but Ange showed us a technique of making dough much wetter than I’d normally make and using a spatula to scrape, stretch and slap the dough, rather than the kneading and pummelling technique (or food processor) I’ve used in the past. Although tentative at first, we all quickly got the hang of this new technique, with one of the participants slapping her dough down so hard, it shot off the work station, narrowly missing Angela. It was great fun and great therapy, although I must have put a bit too much welly into it as I ended up with a blister on my finger. On the plus side, I think it has helped to sort out the old bingo wings! We made Fougass, a French leaf shaped bread, ideal for dunking in balsamic and oil; a white tin loaf and then some brown rolls and the morning just flew by. We saved some dough from our loaf to make into our lunch – a pizza base which we topped with lovely home-made tomato, garlic and basil sauce to which I added goats cheese, yellow courgettes, grated cheddar, a few chilli flakes and sliced green and red peppers. Over lunch I chatted to Ange and the other two friendly women who’d come on the course and who had been bread making novices but now felt much more confident, with one saying she was going to chuck out her bread maker and make bread from scratch, it was so easy. Our end products looked great and we all proudly wrapped up our breads ready to take home. As the old cliché goes, the proof of the pudding is in the tasting and although my bread looked great (I thought! ), it now had to pass the family taste test who do not hold back on their opinions. “It’s really good Mum,” was the verdict from the teen as he rooted around in the cupboard to get the balsamic and olive oil - complaining it wasn’t extra-virgin! - I’d have been happy with a bit of butter at his age. I have to say the white loaf did taste a-ma-zing – still fresh and warm from the oven and I hope the brown rolls taste as good because as greedy as we are, we couldn’t manage eight brown rolls in one day, but they’re in the freezer and will be a lunch to look forward to. The Good: It was great to do something a bit different, enjoying making bread from scratch and having a laugh alongside it. The Not so Good: My baking blister – didn’t expect that! Go again? – Yes definitely. I’d recommend Conibear’s Kitchen. Ange is a warm, patient, fun trainer with her passion for bread making coming over strongly. I’d also be interested in going on one of the pasta making courses she’s planning for the future.